Ottokie Ashoona was born on December 17, 1970 in Cape Dorset, Baffin Island. He comes from a family of world-renowned Inuit artists: his late father Kaka and his late uncle Kiawak were two prominent Cape Dorset sculptors; his grandmother Pitseolak Ashoona was famous for her drawings and prints. Ottokie learned to carve at a very young age. It was Ohito Ashoona, his step-brother and also a well-known sculptor, who imparted the greatest influence on Ottokie’s artistic development and expression. Often, they would carve together, and one can see many similarities between their carvings, especially with the polar bears. Like many Inuit artists, Ottokie draws his inspiration from Arctic wildlife. His favourite subject matter is the polar bear, and he often portrays them swimming, crouching, sitting, sleeping, and on the prowl. His ability to capture the movement and vitality of the animal is remarkable. Ottokie’s style is highly representative of Cape Dorset Art. It is rooted in a love of naturalism, but has incorporated an affinity for decorative stylization and dramatic expression. 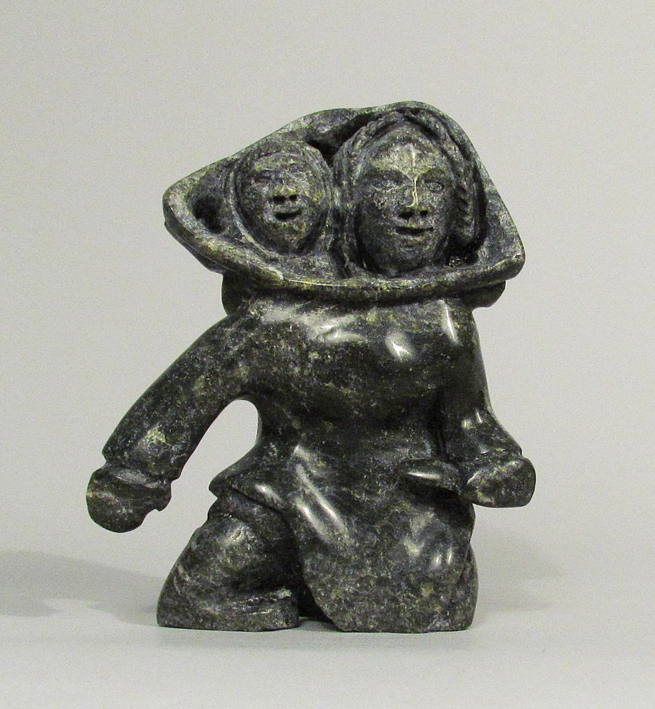 His sculpture entitled “Mother and Child” demonstrates his naturalist style and his affinity for traditional Inuit life. Ottokie takes great care in choosing the stone. His carvings are made of the finest serpentine, a metamorphic rock unique to Baffin Island, of varying green shades, often with gold veining, smoothed and highly polished to best exhibit the beauty of the stone.